With the classic style and rock star flair of its namesake comes the Jagger hobo from Pour La Victoire. Initially I was disappointed that the accents were kept to a minimum, but the more I look at the Jagger the more I appreciate its subtlety. By limiting the studs to the sides of the hobo, Pour La Victoire's ensured the Jagger won't date. I can't promise it'll rock for as many decades as the Rolling Stones singer that shares its name, but it should survive several seasons of regular use. The Jagger's looks are its biggest draw card. I wouldn't say that it's difficult to use, but Pour La Victoire doesn't do anything to make it particularly manageable. The trio of interior pockets might be enough for a regular hobo, but they're not really enough for a bag so large. I hope you know how to keep your items in order, because the Jagger won't help you out. The biker black bag is probably a more rock and roll choice, but I prefer this stormy taupe hue. Which one's your pick? 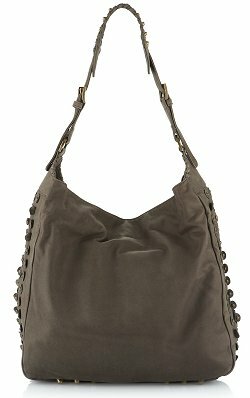 The Pour La Victoire Tiered hobo bag, a great alternative to this studded bag.